A series of reports that began with a heart-wrenching call to NBC 5 Investigates from a grieving St. Charles mom has come full circle. Her complaint, as well as similar complaints from other NBC 5 viewers, raised questions about the country’s largest airline and whether it ignores its own policies when it comes to handling the refund requests whose family members have died. Felicity Cantrell turned to NBC 5 Investigates last March after the sudden death of her daughter, 9-year-old "Scout," to complications from an extreme asthma attack. After submitting a copy of Scout’s death certificate and obituary, the family was told it could not get a refund for her unused ticket. In a letter, American Airlines said it could not "offer a refund, issue a travel voucher or transfer the ticket to another person." But after our report aired on television and was widely shared on the Internet, the airline acknowledged it should have handled the request with more sensitivity and reached out to the family via telephone to apologize and complete the refund. That report also prompted a flurry of other complaints from NBC Chicago viewers who said the same thing happened to their requests for refunds after ticketed family members passed away. In Des Plaines, Sharon Parcell said American Airlines ignored her repeated attempts to get a refund after her father-in-law, Donald Parcell, died last fall. The Parcells had planned to go to Puerto Rico in late March -- a trip meticulously planned by "Grandpa" Donald Parcell. When he passed away, Sharon Parcell said she sent the required death certificate. Months later, she said American Airlines continued to disregard her repeated requests for the refund outlined in its guidelines. "I’ve mailed it at least three times and faxed it once," Sharon Parcell said. "I think I’ve called probably nine or 10 times, and I even asked [if there was] someone else I can talk to." It's a timeline that is familiar to Cliff Boggs. "You can’t talk to a live person when you need a refund," Boggs complained. His dad, Walter, died last November, right before a trip Boggs had booked to go see him in Tennessee. 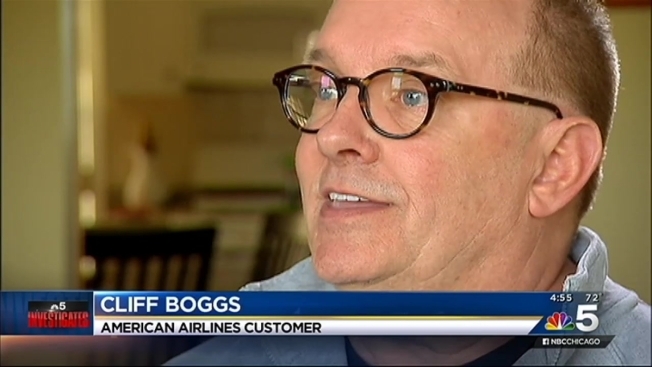 It's a situation outlined on the American Airlines website as a permissible reason for a refund, but Boggs said he submitted the death certificate and waited for months with no word from the airline. "I can't believe that for the thousands and thousands and thousands of dollars that I've spent over the years flying American, that you know, the one time that I need sympathy, empathy and action, I can't get anything," Boggs said. Bill Harfst of Crystal Lake wrote to NBC 5 Investigates after he lost his wife of 42 years, Marilyn, shortly before a planned second honeymoon trip to Hawaii. "I purchased a non-refundable ticket to Mexico departing on March 6, 2013. My wife of 42 years died on March 2 with the memorial service on Thursday, March 7. I made two attempts to get a refund or voucher for a future flight from American. They denied my requests claiming, 'the ticket was only good for one year from date of purchase and the fares were non-refundable fares, we cannot make any exceptions to our policy regarding this issue.' Really? My wife died.....,” Harfst wrote. Is there a pattern of American mishandling the refund requests of passengers whose ticketed family members died before travel? An AA spokesperson did not answer that question, but did look into the complaints of Sharon Parcell, Cliff Boggs and Bill Harfst. All received refunds after our inquiry. A spokesperson did say the Cantrell’s case should have been handled with "more sensitivity."